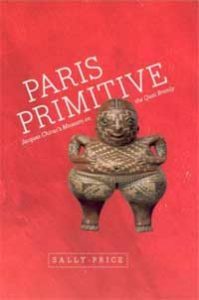 This new book by Sally Price explores the story behind the creation of Paris’ newest museum devoted to the so called “primitive arts.” The story begins in 1990 when Jacques Chirac, the future president of France and a passionate fan of non-European art, met Jacques Kerchache, a maverick art collector with the lifelong ambition of displaying African sculpture in the holy temple of French culture, the Louvre. Together they began laying plans, and ten years later African fetishes were on view under the same roof as the Mona Lisa. Then, in 2006, amidst a maelstrom of controversy and hype, Chirac presided over the opening of a new museum dedicated to primitive art in the shadow of the Eiffel Tower: the Musée du Quai Branly. “Paris Primitive” recounts the massive reconfiguration of Paris’s museum world that resulted from Chirac’s dream, set against a backdrop of personal and national politics, intellectual life, and the role of culture in French society. Along with exposing the machinations that led to the MQB’s creation, Sally Price addresses the thorny questions it raises about the legacy of colonialism, the balance between aesthetic judgments and ethnographic context, and the role of institutions of art and culture in an increasingly diverse France. Anyone with a stake in the myriad political, cultural, and anthropological issues raised by the MQB will find Price’s account fascinating. Paris Primitive: Jacques Chirac’s Museum on the Quai Branly, by Sally Price (University of Chicago Press, 2007), 224 p. at p.123.